You can define phase enforcement for particular phases of a repair location which means that some phases must be done in a certain order, while others can be done in any order. Important! 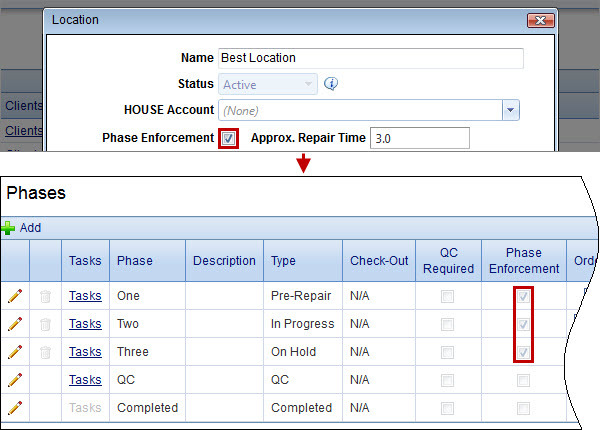 Once the Partial Phase Enforcement feature is turned on, all new repair orders will comply with phase enforcement setting defined per phase, and there will be no Phase Enforcement switch on the toolbar of the Repair Order detail view (though this switch will still be shown for repair orders created before the feature was turned on). On the Monitor tab, click Repair Locations, and then click the Phases link next to the appropriate repair location. On the Phases page, click Edit next to the appropriate phase, and then in the Phase dialog box, select the Phase Enforcement check box, and then click OK. 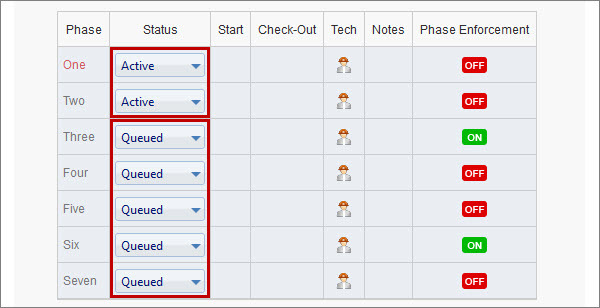 Tip You can see whether phase enforcement is set for particular phases in the Phase Enforcement column on the Phases page. 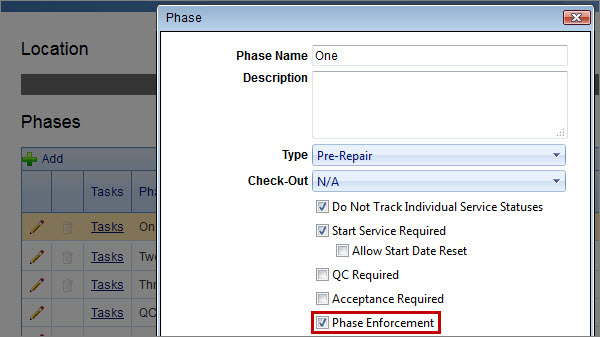 ...and when you select the Phase Enforcement check box for a repair location, the Phase Enforcement check box will be automatically selected for all its phases (except for the QC and the Completed phases that were created automatically). Important! If there is at least one phase with phase enforcement, all next phases (either enforced or not) will be queued until this phase is completed. For example, you have a repair location with seven phases, but only phase Three and phase Six are enforced. Note We have added the Phase Enforcement column to the Phases section, so now on the Repair Order detail view you can see whether phase is enforced. 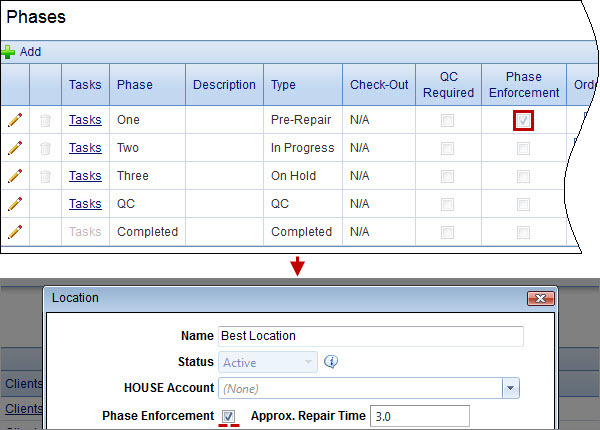 When you create a repair order for this repair location, phase One and phase Two will have the Active status (because there are no enforced phases before them at all), while phases Three to Seven will have the Queued status. 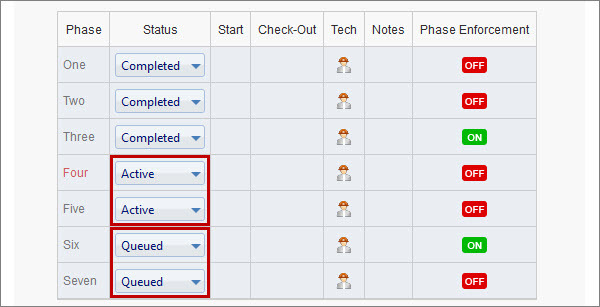 When you complete phase Three, the status of phase Four and phase Five will be automatically changed to Active (because there are no uncompleted enforced phases before them any more), while phase Six and phase Seven will remain in the Queued status.